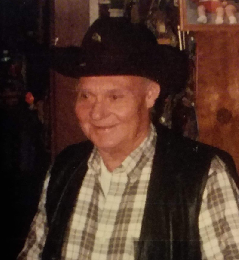 Melvin Eugene Gray, 83, of St. John, KS, went to be with his maker on December 1, 2018 at Woodhaven Care, Ellinwood, KS. He was born June 20, 1935 in Seminole, Oklahoma, the son of William A. and Sarah E. VanBuskirk Gray. Melvin has resided in St. John for the past 20 years, formerly of Great Bend, KS. He worked as a roughneck in the oil patch most of his adult life in Oklahoma and Kansas. On August 18, 1952, Melvin was united in marriage with Norma Lea Allen in Oilton, Oklahoma. She preceded him in death on April 14, 2015. He is also preceded in death by his parents; infant son, Elmer Gray; daughter, Rhonda Gray- Krom-Rowe; siblings, Mable Gray, Lawson Gray, Freda Gray Brown, H.T. “Red” Gray, W.A. “Bill” Gray, Pat Gray Tompkins; and grandson, John P. Delgado. He is survived by his eight children, Dianne Willesden and husband Bob of Great Bend, KS, Tommy Gray and wife Carol of Pawnee Rock, KS, Ruby Byerly of Great Bend, KS, William Dolezal and wife Jolene of Beatrice, NE, Katherine Hughes and husband Robert of Urbana, MO, Rodney Gray of Great Bend, KS, Treasa Hester and husband Jack of Clovis, NM, and Melvin W. Gray and companion Janie Skinner of Warrensburg, MO; three sisters, Nancy Gray Wiggins, Fondella Davis and husband Wiley, and Letha Gray Parker all of Oklahoma; thirty-three grandchildren; seventeen great-grandchildren; and numerous nieces and nephews. Funeral service will be 1:00 P.M., Saturday, December 8, 2018 at First Assembly of God Church, Great Bend in the main sanctuary with Pastor Jane Heeke officiating. Burial will be at Chase Springdale Cemetery, Chase, Kansas. Memorials can be made to the Dream Center of Great Bend in care of Birzer Funeral Home, Lyons.